Legend has it that the Golden Retrievers were descended from Russian sheepdogs bought from a circus, however, the truth is the breed was actually developed in Scotland, in the late 1800s, at the highland estate of Sir Dudley Majoribanks, later known as Lord Tweedmouth. Tweedmouth, like many gentry of his day, bred animals of all kinds, trying to perfect different breeds. Tweedmouth's breeding records from 1835 to 1890 show what he was aiming for with the Golden: A talented retriever. Tweedmouth was an ardent waterfowl hunter — with a superb nose, who would be more attentive to his human hunting companion than the setters and spaniels used at the time for retrieving. He also wanted the dog to be loyal and even-tempered in the home. He began with a yellow dog named Nous, who Tweedmouth bought from a cobbler near Brighton in 1865. Tweedmouth favored yellow dogs, and Nous — whose name means 'Wisdom' — was the only yellow puppy in a litter of black Wavy-Coated Retrievers. Nous and Belle's descendants were bred with Wavy- and Flat-coated retrievers, another Tweed Water Spaniel, and a red setter. Tweedmouth kept mostly the yellow puppies to continue his breeding program, and gave others away to friends and relatives. Lord Tweedmouth originally crossed the yellow Flat-Coated Retriever with the now extinct Tweed Water Spaniel. Later he mixed in some Bloodhound, Irish Setter and more Tweed Water Spaniel. The dogs were called the Golden Flat-Coat and only later were they given the name Golden Retriever. Golden Retrievers have super talents in the areas of hunting, tracking, retrieving, narcotics detection, agility, competitive obedience, performing tricks and of course Service Dog to humans in numerous categories including Blind, Deaf, Autism, Cancer detection, etc. He began with a yellow dog named Nous, who Tweedmouth bought from a cobbler near Brighton in 1865. Tweedmouth favored yellow dogs, and Nous — whose name means wisdom — was the only yellow puppy in a litter of black Wavy-Coated Retrievers. •	The Golden Retriever needs to be taken on a daily, brisk, long walk, jog or run alongside you when you bicycle, where the dog is made to heel beside or behind the person holding the lead, as instinct tells a dog that the leader leads the way and that leader needs to be the human. In addition, they like to retrieve balls and other toys. Be sure to exercise this dog well to avoid hyperactivity. •	Easy to groom and keep clean. •	Lovable, well-mannered, intelligent dogs with enormous charm. •	Very little guard dog ability. Outgoing and social, the Golden Retriever makes a loyal family pet. Their sweet dispositions make them patient and gentle with children and they are generally tolerant of other pets. It is important to remember that they are excitable as pups, and can accidentally knock children over while playing. Aggressiveness in well-bred Golden Retrievers is not common, but improper breeding can raise the chances of aggression issues. Instead, these dogs are people lovers who prefer to have as much human contact as possible, and can tend to get themselves into trouble if they are frequently left alone. Being forced from their family members for long periods can result in a very unhappy Golden Retriever that could suffer from separation anxiety. Golden Retrievers do not make the best of guard dogs. They will bark at strangers, but seem to be more interested in meeting and making friends with them than they are defending their family against them. They are affectionate, loving and loyal, and try hard to please their people. Golden Retrievers have a high energy level. These fun loving dogs enjoy nothing more than to play fetch or retrieve a stick during play, and their love for water makes for not only interesting play, but also plays a part in their strong hunting skills. Their high level of intelligence enables them to excel in obedience training. They are often trained and used as service dogs to the blind and disabled. Their friendly and affectionate personalities also make them ideal visitors for retirement homes and allow them to be effective therapy dogs. The Golden Retriever's double coat is important to brush on a daily basis. Many Golden owners complain about how much their dogs shed, particularly in the spring months. A strong brush will be your most prized tool when combating dog hair on your furniture, clothes and carpeting. Trimming can be done on occasion. While a youthful Golden Retriever is not as prone to weight issues as other breeds, it can still be a concern for older dogs as they become less active. They are an extremely active breed, and exercise is an important part of their daily care. They must be provided adequate room and time to play, beyond their outdoor potty breaks. Allowing them to retrieve balls, throwing sticks or Frisbees for them, giving them opportunities to play and socialize with dogs as well as a nice walk are all wonderful ways to ensure your Golden Retriever is well exercised. Some other activities your Golden may enjoy include swimming, hiking, jogging or biking. Mental exercise is also important. These dogs are eager to please, and enjoy having jobs to keep them busy and gain approval. Creating fun games or interesting things for your dog to do will keep them entertained and prevent them from becoming bored. Golden Retrievers are known for being an easy breed to train. They are excited to learn, eager to please, and their high intelligence allows them to learn behaviors and tricks quickly. Most dogs from this size benefit from obedience training, and a good program that allows them to socialize with other dogs is an added bonus. Goldens Retrievers are easy to train to do jobs. Golden Retrievers have been trained to work with Police to locate drugs, excel in agility training and enjoy learning how to perform tricks. Golden Retrievers are popular candidates for training to become aid dogs. Their quick minds make them ideal for guiding the blind, and the training for this job begins when they are puppies. They are also trained to do other wonderful things for people such as uplifting the sick, and entertaining the aging. It is important to begin teaching basic commands such as sit, come, stay and heel. The sooner these basic commands are mastered, the easier it will be to manage your dog as it grows and as you are training progresses. Hip dyplasia is a heritable condition in which the thighbone doesn't fit snugly into the hip joint. Some dogs show pain and lameness on one or both rear legs, but you may not notice any signs of discomfort in a dog with hip dysplasia. As the dog ages, arthritis can develop. X-ray screening for hip dysplasia is done by the Orthopedic Foundation for Animals or the University of Pennsylvania Hip Improvement Program. Dogs with hip dysplasia should not be bred. If you're buying a puppy, ask the breeder for proof that the parents have been tested for hip dysplasia and are free of problems. This is a heritable condition common to large-breed dogs. It's thought to be caused by different growth rates of the three bones that make up the dog's elbow, causing joint laxity. This can lead to painful lameness. Your vet may recommend surgery to correct the problem or medication to control the pain. As in humans, canine cataracts are characterized by cloudy spots on the eye lens that can grow over time. They may develop at any age, and often don't impair vision, although some cases cause severe vision loss. Breeding dogs should be examined by a board-certified veterinary ophthamologist to be certified as free of hereditary eye disease before they're bred. Cataracts can usually be surgically removed with good results. PRA is a family of eye diseases that involves the gradual deterioration of the retina. Early in the disease, dogs become night-blind. As the disease progresses, they lose their daytime vision as well. Many dogs adapt to limited or complete vision loss very well, as long as their surroundings remain the same. This heart problem is caused by a narrow connection between the left ventricle (out-flow) and the aorta. It can cause fainting and even sudden death. Your vet can detect it and prescribe the proper treatment. This orthopedic condition, caused by improper growth of cartilage in the joints, usually occurs in the elbows, but it has been seen in the shoulders as well. It causes a painful stiffening of the joint, to the point that the dog is unable to bend his elbow. It can be detected in dogs as early as four to nine months of age. Overfeeding of "growth formula" puppy foods or high-protein foods may contribute to its development. 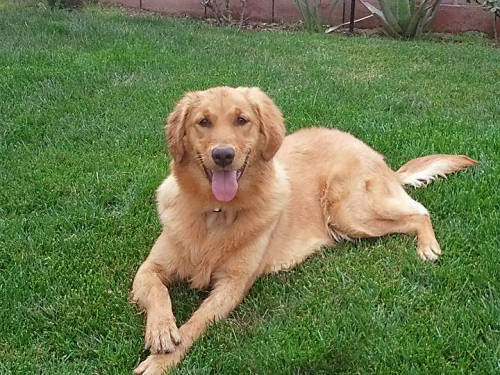 Golden Retrievers can be allergic to a variety of substances, ranging from food to pollen. If your Golden is licking his paws or rubbing his face a great deal, have him checked by your vet. This is an inherited blood disorder that interferes with the blood's ability to clot. The main symptom is excessive bleeding after an injury or surgery. Other symptoms include nosebleeds, bleeding gums, or bleeding in the stomach or intestines. There is no cure, and a blood transfusion from the blood of normal dogs is currently the only treatment. Research is underway for new treatments, including medication. Most dogs with von Willebrand's disease can lead normal lives. A vet can test your dog for the condition. Dogs with this condition should not be bred. Commonly called bloat, this is a life-threatening condition that affects large, deep-chested dogs like Golden Retrievers, especially if they're fed one large meal a day, eat rapidly, or drink large amounts of water or exercise vigorously after eating. Bloat occurs when the stomach is distended with gas or air and then twists. The dog is unable to belch or vomit to rid himself of the excess air in his stomach, and blood flow to the heart is impeded. Blood pressure drops and the dog goes into shock. Without immediate medical attention, the dog can die. Epilepsy is a brain disorder that causes periodic seizures and convulsions. Your vet will need to know how severe the seizures are and how often they occur to determine what medication to prescribe, if any.